It's an odd thing, but I am not really a beach person. My wife even less so. And yet we live in Phuket which is famous for it's beaches. We don't "go to the beach" very often. Our kids enjoy some beach time, but this is not something we do every weekend. 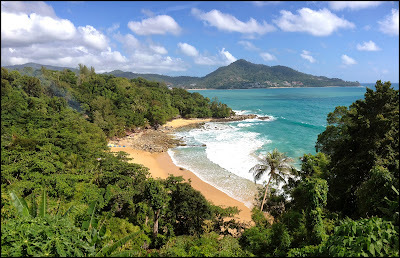 There's a lot more to Phuket than beaches - and that was one of the reasons I started this blog! 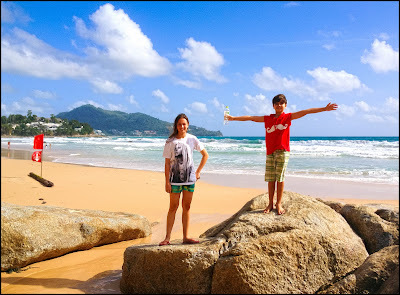 If we do "hit the beach" then it's likely to be a quiet one rather than one of the main west coast beaches in Phuket. Last weekend we took a little afternoon drive. We do that sometimes .. just "go for a drive" and see where the road takes us. 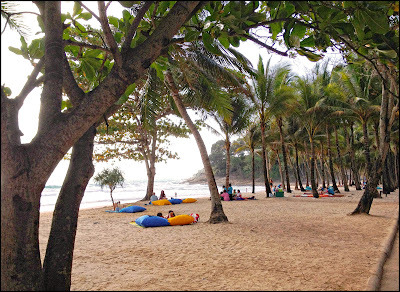 My wife and I figured that the last time we'd been to Surin beach was in 2006. That sounds kind of crazy, but do remember, we are not on holiday here .. we have a normal life of work and school and bills to pay. At weekends we might go away, might take a trip somewhere, or more likely do the garden, kids go to music class, have an easy day at home after a week of work and school ... Last weekend I wanted to check out Surin beach because with the support of the current military leadership of the country, Phuket has developed some cojones and issues like taxi gangs and illegal building on the beaches are being tackled. 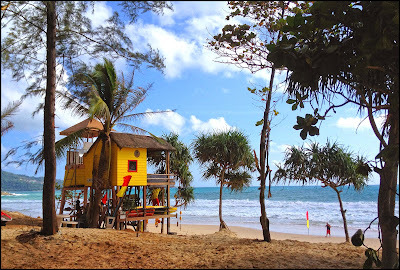 I wanted to see Surin now that restaurants on the sand and "beach clubs" on the sand had been removed. (above) The result ... no building on the beach. Only sand, palm trees and a few lucky low season visitors. 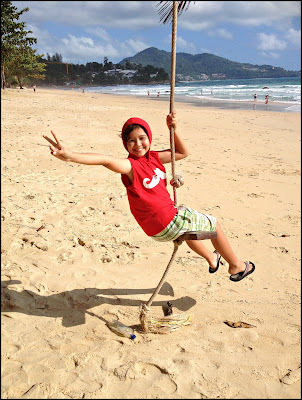 Kids + beach + rope swing = who needs an iPad? Well, our kids have got used to our sudden urges to take a drive. They might complain, but then enjoy the chance to explore. While the boy jumped around on the rocks, the girl walked to the very end of the beach. Maybe someday she will take the road less traveled. Crowded beaches? Where? I do like the idea of keeping the beaches natural, but people gotta eat and drink! I imagine that once the whole thing blows over you will see drinks vendors on the beach, then maybe some little mobile food stalls, and then a little bamboo restaurant and maybe the whole thing will start again! Surin is a nice area to stay, there are plenty of hotels including Ayara Hilltops, Twin Palms and Manathai Resort. 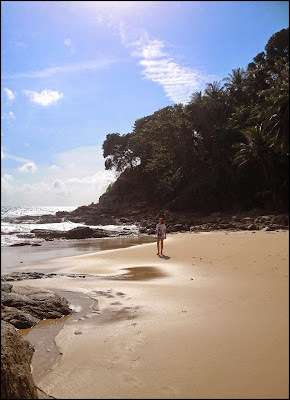 We left Surin, heading back home via Kamala and Patong, but first ... in between Surin and Kamala beaches used to be a little gem called Laem Sing beach. Untouched. No construction. And I think my wife and I had not stopped there since about 2001! Back then, Laem Sing was a totally untouched paradise, but of course over the years a bar opened, and another and a restaurant and another one. Now, with help from the friendly Thai army, all that will be gone. Laem Sing will be the next blog post, as we stopped there on the same day. Just south of Surin is a viewpoint with a great view of Laem Sing beach. Wow.